Another season has come, and it's (almost) officially Summer! That means it was time to receive the Luxebox, summer edition! Now I'm still pretty new to Luxe Box. I had only received the Spring box previously, so I was excited to receive this one. At the time I had signed up, I then realized that Luxe Box and Topbox were ultimately the same company. However, I didn't think there would be too many repeats, just because Luxe Box sounds more "high-end" I guess. Queue Summer Luxe Box 2016. They decided to stop including product cards and will now email them to customers. Its more environmentally friendly, I get it. Well, I can't say that I'm super excited about anything really. I know we should all be using sunscreen every day, however I usually forget and I don't do it. I should because I'm as white as a piece of paper, but I've never done it consistently enough to make it a habit. Most of the time sunscreen burns my face. I haven't used this yet, and I was going to gift it to my brother since he was going on a trip to Hawaii, but he didn't want it. I'll hold onto it, and try and remember to use it throughout the summer. I've received samples of this hair mask in the past, and I didn't find it to be anything special then. I used it again now, and the jar is so small that it makes it a little difficult to get out. But it did leave my hair nice and soft when I used it in the shower. I used it more as a deep conditioner for about 3 minutes, so I will have to try it again and leave it on my hair for at least 20 minutes next time. 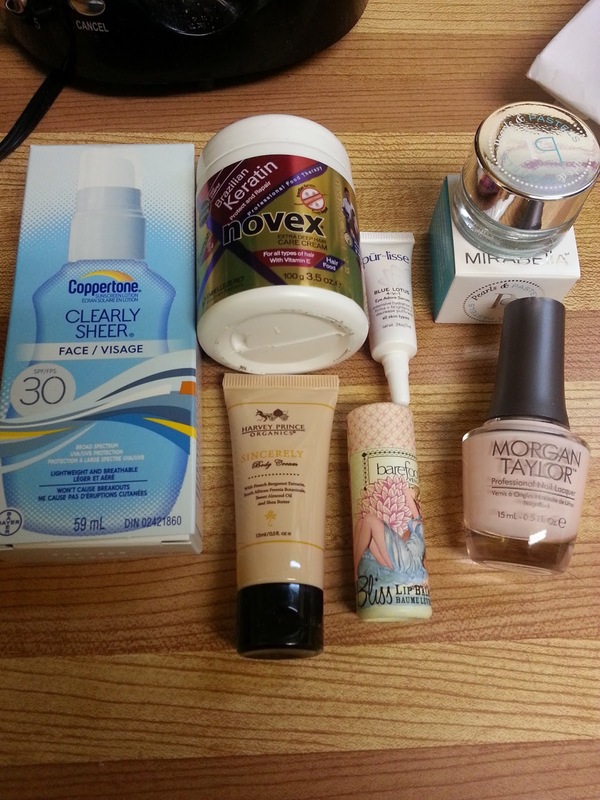 Also, this is a repeat for me since I just received this in my May Topbox. I haven't opened this one up yet since I have so many other body creams on the go. I'm sure I will give a better review of this when it goes to the empties pile in a few months. I received this in my April Topbox. I wouldn't say that it's the greatest product ever, and it definitely is more of a serum than it is an eye cream. It provides decent hydration to my under eye area, however I've found that I cannot wear it during the day, as the serum somehow gets into my eyes, and ruins my contact lenses for the day. This can only be worn at night. I haven't found any difference in my under eye circles, or rare puffiness. They will both be used though. This is in a coconut scent, and was the weirdest package to open. Especially on a lip balm. The cap comes off, but you have to PUSH the bottom piece up in order to get any of the product. Kind of like a push pop candy. Remember those? Yup, that's how this lip balm works. I'm not a fan of the packaging, but it smells nice and it did hydrate my lips, so I will use it, but will forever be confused at the packaging. This is a mint blue/green pigment eyeshadow. The colour would never work for me. And after some research, this product was "new" in 2014. This can now be found in their closeout section for $10 on their website. I don't want 2 year old mint eyeshadow. I want to pass this on but I'm not sure if I should. I won't be using it. This is a pretty pale pink that will work well for subtle polish. Again, as I mentioned in my Topbox last month, I've never heard of Morgan Taylor until I started to receive them in these boxes. This is probably the 3rd of 4th I've received since I subscribed whenever Birchbox pulled operations in Canada. It's not horrible formulation, but it's not the greatest I've used either. Lots of colours to choose from, and I like this shade, so it will definitely be used this summer when I have some weddings to attend. After consideration of the products I received, I decided to cancel my Luxe Box subscription. This bag does not feel to be worth $26. It does arrive quarterly, but to me, it's not worth the subpar products, especially when Topbox is half the price.